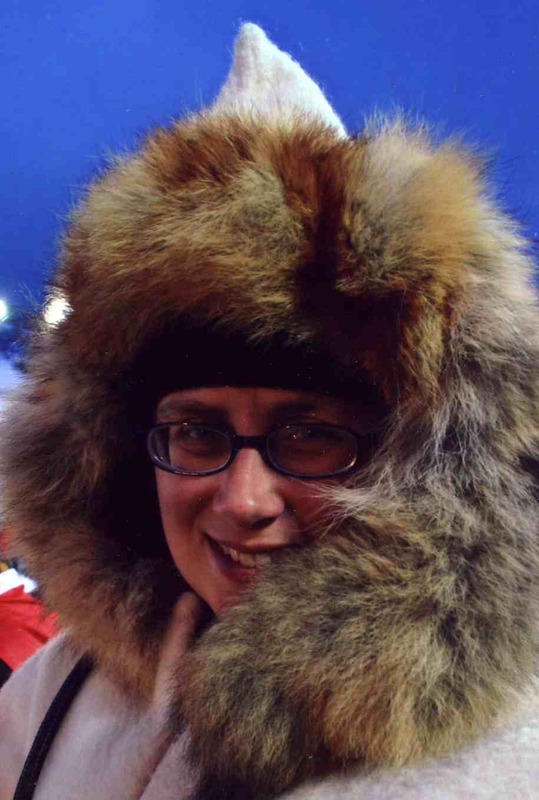 Karen Romano Young (right), a freelance writer and illustrator embedded with NASA’s ICESCAPE field campaign, sent this report from an icebreaker headed to the Arctic. You can follow the expedition on the ICESCAPE blog. Here on the U.S. Coast Guard Cutter Healy, heading north toward sampling stations in the Bering Strait, there’s plenty of light — a beautiful radiance nearly around the clock. Since arriving in Alaska on June 12, I’ve only awakened once in the middle of the night to find it dark. Last night at nearly 11 p.m., I sat drinking tea in front of my porthole, and saw a rainbow descend between strips of clouds into the grey Bering Sea. We’re in the land of the midnight sun, and as we continue north the night light will grow longer. It’s the opposite of the conditions that lead to Seasonal Affective Disorder down south where I come from (Connecticut!) For me, it’s joy. Up here where there used to be more ice, the radiance is, well, radiating. This is the key: the Arctic ice reflects sunlight back into space. If there’s no ice, the sunlight goes into the water, warming it, and creating an environment in which phytoplankton — tiny plantlike algae at the water’s surface — can thrive. There’s less ice because our atmosphere is trapping greenhouse gases — carbon dioxide and methane — and the result is a warming Arctic. 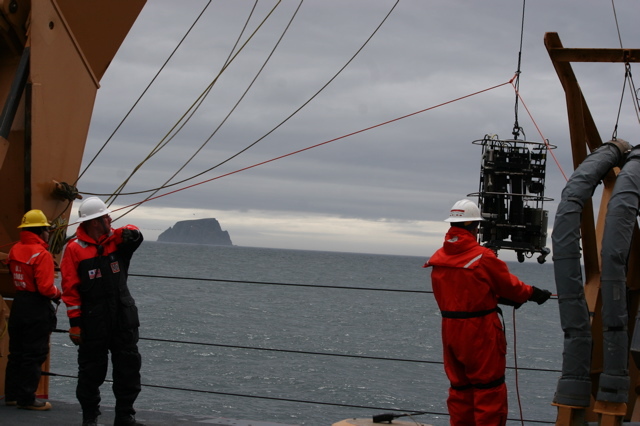 Many of the 40-plus scientists participating in ICESCAPE, a NASA-led research cruise, are involved in studying the effects of sunlight. ICESCAPE stands for Impacts of Climate Change on the Eco-System of the Arctic Pacific Environment, and its purpose is to bring ice scientists and ocean scientists together to gather a greater understanding of the conditions in the Bering, Chukchi, and Beaufort Seas. Who better to begin a discussion of the sun’s warming effects than a University of Washington scientist named Bonnie Light? 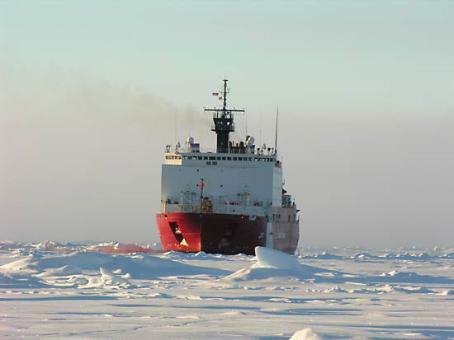 Light has been working in the Arctic Ocean since 1998 when, as a grad student, she boarded the Canadian icebreaker Des Grosseilliers, which had purposely pulled up to the edge of the 1997 autumn ice and got fro-zen in through the 1998 thaw. That was the SHEBA (Surface Heat Budget of the Arctic) project, designed to increase understanding of the Arctic system. Getting frozen in to the ice was a nod to the so-called “father of Arctic science,” Fridtjof Nansen, who purposely did the same a century earlier to prove his theory that the ice cap drifted. One of the purposes of SHEBA was to provide a baseline for under-standing Arctic conditions that might be affected by global warming. 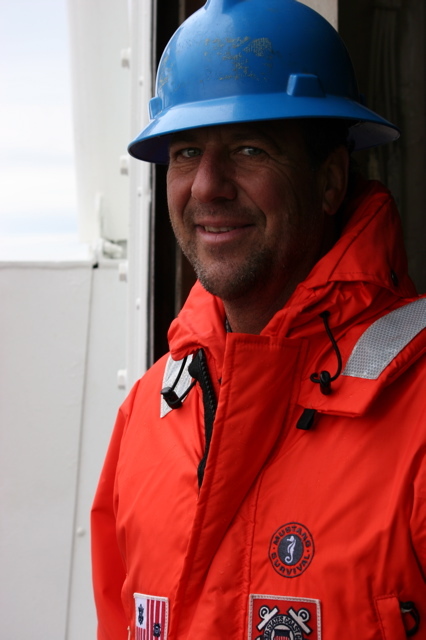 Several other scientists aboard ICESCAPE also participated in SHEBA, including Bonnie’s group leader and co-chief scientist Don Perovich. The flight to the SHEBA site from Barrow, Alaska — the northernmost city in the United States — was the first time Light saw sea ice. “I’d calculated the total square kilometers that the Arctic ice cap occupies many, many times,” she said, “but to be in a little air-plane and fly over it and just see it…this endless stretch of pack ice was really striking.” During the ICESCAPE cruise she is eager to explore the western coast of Alaska for the first time. Light is interested in the physics of solar irradiance – what happens to the sun’s light in ice on a small-scale, but also at the larger scale of the melt ponds that form atop sea ice. One of the experiments she’ll conduct involves a comparison of how sun radiates through bare ice and ice that has a melt pond on top. “We already know that melt ponds make really good skylights,” she says. But could they accelerate melting of already-melting ice, hastening the tipping point between ice cover and open sea? Bonnie Light’s ICESCAPE experience could tell. 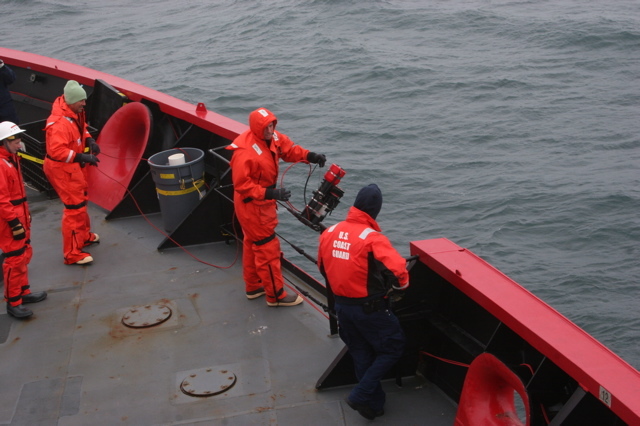 Image Information: Courtesy of the U.S. Coast Guard (bottom left) and Karen Romano Young (top right). Earth Science Picture of the Day (EPOD) recently ran a series of photos that illustrates nicely the impact that small airborne particles called aerosols can have on light. 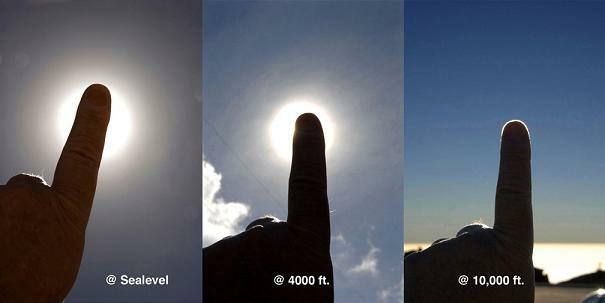 As EPOD notes, the size of an aureole — the halo-like circle that appears around the sun when viewed through a haze or mist — depends on the amount of aerosol in the air. More aerosols mean more light is scattered, which produces larger aureole). Since most aerosols are concentrated near Earth’s surface, the aureole at sea level appears much larger than it would high on a mountain peak. You can try this experiment yourself to get a sense of the aerosol load in the air you’re breathing. Aerosols are a major preoccupation for climate scientists as the particles—including dust, ash, sea salt, soot, and industrial pollutants—can scatter light and affect Earth’s energy balance. Infusions of ash and sulfate from volcanic eruptions, for example, are capable of cooling global temperatures by 0.3 degrees Celsius. Likewise, sulfate aerosols from factories and power plants can mask global warming somewhat and are often bandied around as possible components of geoengineering schemes. Want to learn more about how aerosols scatter light? 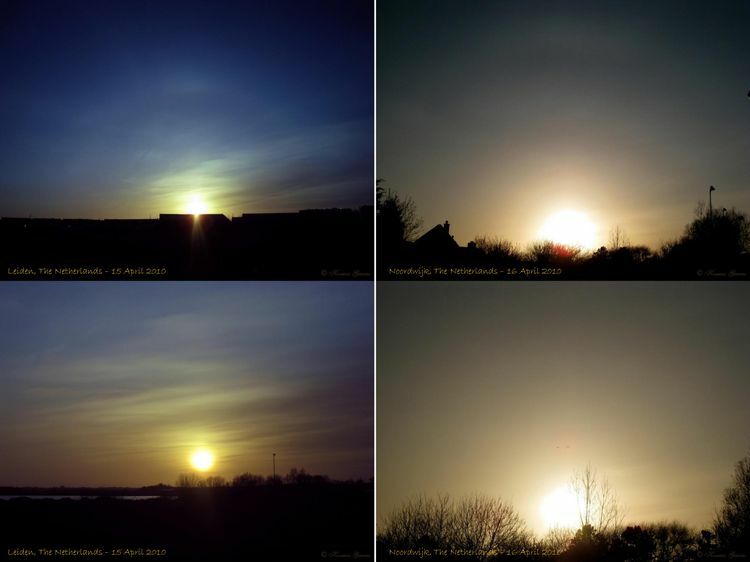 EPOD has another post on the topic that compares aureoles at sunsets in the Netherlands before (below left) and after (below right) the arrival of a massive volcanic ash cloud from the eruption of Eyjafjallajökull. Also, for optics aficionados, a site called Atmospheric Optics will walk you through a number of interesting examples of aerosols and atmospheric water and ice scattering light.